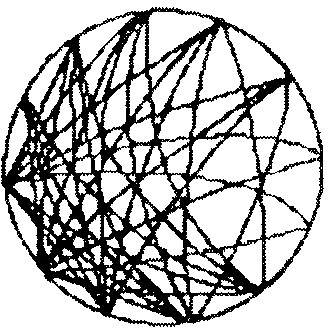 People intuitively use the word “network” with a remarkable consistency that continues to surprise us. The idea evokes a clear, simple mental model, a structure of points or circles and connecting lines—nodes and links, vibrant with purposeful activity. Where people get fuzzy is in describing how a network or virtual team actually does anything coherent, how it moves in time. As we see it, this is a problem of perception. To see something like a network or virtual team, you need to look at it from several points of view simultaneously. 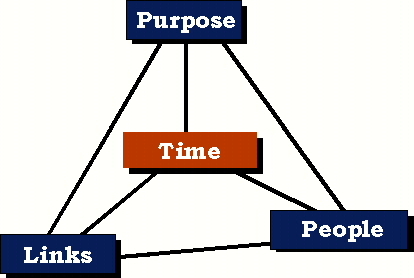 The People-Purpose-Links-Time model provides four interrelated dimensions for seeing a group. With this model, you can hold something as distributed as a network and something as immediate as a virtual team—people linking with purpose over time. April 24, 1991, is a big day at Digital Equipment Corporation, a peak day just before the long decline and eventual disappearance (into Compaq) of this groundbreaking company. McDonnell Douglas, now a part of Boeing, chooses Digital as one of two final bidders to become the computer systems integrator for its new commercial jumbo jet, the MD-12. To respond to this highly complex bid, Digital’s core team of nine needs to expand to about 50 people—technical experts from across the company representing several dozen disciplines. To win, Digital has to rapidly create and make operational a team that crosses traditional boundaries. A few days after Digital’s selection as a finalist, the core team meets to plan its next steps in Digital’s Irvine, California, facility. Irvine is just a short ride south on Route 405 from Douglas Aircraft’s Long Beach headquarters. The planning meeting is a “raucous event,” according to one participant. With phones ringing, and people coming and going, the group still manages to churn out some of the essentials: A mission statement, a list of broad goals, a “key concepts” graphic, and the invitation list for the second meeting a week later. The group statement of purpose—to win the MD-12 bid and prepare Digital to deliver on the contract—expresses why the group wants to cooperate for mutual benefit. Two weeks later, the “MD-12 Team” numbers 30. It meets in Irvine again to integrate new people and repeat the process the core group went through. The team reviews the purpose, translates it into a clear set of goals, and begins to assign tasks. Ten days after that, a third planning meeting takes place, this time in Massachusetts, near Digital's home base on the East Coast. Fifty people attend, representing engineering, manufacturing, and services. They iterate—go over—all the aspects of the plan again, subdividing into seven distinct “Goal Teams.” Each addresses a separate objective, each has its own leader, and each depends on people working together from different functions. Tasks are designed and assigned for each component part of the proposal to Douglas. Each Goal Team competes for management attention, organizational support, and allocation of overall resources, both within the team and with other parts of the corporation. A “close to the customer” salesman, Paul Beltis, brings Digital the MD-12 project. As a long-time vendor to Douglas, Beltis invests in personal relationships and chance encounters at the customer site. Eventually, he detects the early signs of a new program that in time will need a systems integrator. Systems integrators tie together the disparate parts of an organization’s computer installations. Since at that time, in the early-1990s, most companies have bought their computer systems without much planning, it’s a huge market. Douglas does not list Digital as one of the original companies invited to bid on the program, which includes IBM, Hewlett-Packard, Andersen Consulting, Computer Sciences Corporation, and Electronic Data Systems. Digital wins its spot when a few of its people, including Ulf Fagerquist, a very senior, experienced executive, participate in Douglas’s six-week MD-12 brainstorming session in Summer 1990. During that session, Digital positions itself as understanding the process of product development. The building of the MD-12, with its complex partner/investor arrangement—each major “supplier” will invest its portion of the plane, including the engines, the wings, and the fuselage—is less an engineering and manufacturing issue than it is a process one. Digital’s central message to Douglas is simple: “Integrate process and product,” which Digital holds to through the down-select and its final bid. Why does Digital make the final bid round, when it doesn’t even qualify for the first round? It sponsors a key customer event. In mid-March 1991, Digital facilitates and hosts a three-day meeting for the senior Douglas MD-12 executives in Digital’s Irvine facilities. Under preparation for months, and delayed several times, the MD-12 general managers’ meeting finally takes place just as Douglas names a new MD-12 program manager. The meeting includes his boss, the vice president charged with new product development. In this ideal, though intense, session, the importance of attention to process demonstrates its power in the team’s development. Our role at this event and in the resulting MD-12 project is that of process consultants. The executive conference room is packed. There are 10 general managers from Douglas and six people from Digital, along with some laptops, an electronic whiteboard, a poster-maker, and numerous dignitaries floating in and out. With more than 200 years of plane-building experience in the room, the group devotes its first day to establishing purpose. They agree on a mission statement, strategies, key concepts, and common assumptions. Here, preparation has been critical. For several months prior, a Digital management consultant works these elements in interviews with the Douglas managers and their staffs. The two weeks before the meeting have been particularly intense and the group experiences considerable success in this part of the process. During the next day and a half, the group sketches out two plans, one for the next four months, and the other for the next five years. They define phases, list tasks, rough out the logic, and estimate times, some in detail. The Digital team captures all this information in real time, both with traditional notes, flip charts, and the electronic whiteboard, as well as directly into word processing on laptops and into other computer modeling tools. The software tools not only record the data, but process it, too, generating several simultaneous views, including a schedule. Because of the fast turnaround time, the group has its first view of the data within hours. It is able to revise its assumptions, enabling participants to see the effects of their changes. In 36 hours, they complete three iterations—run-throughs—of the short- and long-term MD-12 plans. By the end of the third day, the group begins to make key decisions as certain things become obvious even at the coarse level of detail. This meeting reinforces Digital’s message about the importance of process. While demonstrating its capabilities, it also obtains invaluable insight into the program. Significant personal relationships strengthen among people in the two companies, while Douglas benefits from a genuine service. Six weeks later, Douglas selects Digital as one of two finalists. The other is EDS. Douglas forms technical evaluation teams to review the proposals. It assigns an official liaison person to the Digital team, whom Digital in turn invites to its team planning meetings. Douglas provides security badges and makes offices available to all members of the Digital team; Digital then shifts its base of operations from Irvine to Long Beach. The aircraft company assures access to its people so that Digital can obtain the information it needs to propose solutions and make its bid. It sponsors tours of the MD-12 production facilities, its current flagship plane. EDS enjoys the same privileges. One day during the project, an MD-12 team member says, seemingly out of the blue, “158.” His partner laughs. We are all standing in the Irvine hallway as a Digital employee from the United Kingdom walks by. They interrupt each other to explain that they’ve been keeping track of the number of people involved, and the British fellow who just walked by is the 158th person to be associated with the MD-12 project. In a few weeks, the Digital team grows from an ad hoc, mostly part-time group of fewer than 10 to a funded, functioning program of 50, with as many more active at any one time, drawing on and reporting to several hundred more. To plan its work and get up to speed, Digital uses the same process it employs with Douglas. The company holds a series of three planning meetings over the next several weeks. In these meetings, the Digital team designs the organization that will guide it for the next four months until proposal delivery at the end of August. We call these meetings Work Process Design sessions. The first iteration of the Digital team’s own process is the raucous two-day event at the beginning of May. By the second session, the group has grown to 30 or so, people who have much of the experience and life cycle diversity (e.g., engineering, manufacturing, and product support) required to develop a comprehensive proposal. The packed conference room looks much like the MD-12 general managers’ meeting held just across the hall eight weeks earlier. Over the next two days, the group clarifies its purpose, defines its goals, and forms “Goal Teams.” Materials developed in the first session seed these tasks, which speeds things up. With attention paid to leaving enough time for “bio breaks,” meals, and schmoozing, each goal team brainstorms its lists of tasks, then reconvenes with the other goal teams to knit together the overall logic. In the large group, people identify who will own each task, define cross-functional relationships, and estimate how long each task will take. With the same simple set of tools used in the March Douglas meeting, the team captures, displays, revises, and redisplays its planning data quickly enough to iterate it twice. People leave with a 30-page handout of their joint work, including a directory of participants, a schedule, and a deployment chart of processes, milestones, and deliverables. While the team accomplishes a great deal in a short time, it is still in its very early shake-out period. Clearly, the group needs more time to complete sufficient planning, and, of course, politics and power problems erupt. Some gaps open up, and the team realizes it needs to involve other people. In the next few days, the team reforms and heads east for one more two-day planning meeting the following week. For the third meeting, each team member receives a personalized “MD-12 Program Handbook,” containing basic information, key documents, the work process design and results to date, with their names printed on the cover and the spine. Directories, task lists, models, schedules, and the like all have their places in the three-ring binder, designed for updates of more current material. With some new blood and a chance to absorb the experience of the previous week, the team runs through the process again. The goal teams, which now have formal status in the group, break out tasks by specific deliverables, schedule key meetings, and define where they will have to make major decisions. They work on the task logic, resolving vague and overcomplicated areas. People review their commitments, including the cross-functional ones. They estimate resources and generate rough budgets. The meeting far exceeds most people’s expectations and Digital’s MD-12 team is launched. During the third session, an ad hoc group forms—including people from several goal teams—to look at the whole life cycle of the MD-12 plane-building process. Digital has won down-select on its process promise. Now the task is to produce a plausible high-level process view of the plane as a whole. Digital will tie its technology solutions to the work described in that view. A self-initiated team pulls together the available information and begins the process of synthesizing an initial picture of the MD-12 life cycle. Three weeks later, Digital invites key Douglas general managers and their staffs to a presentation of its initial findings. It’s the ribbon cutting for Digital’s “MD-12 Process Room”—the first of several process rooms at both Douglas and Digital. The oddshaped room (it’s a skewed trapezoid, widening from 12 to 15 feet along its 20-foot length) contains graphics of the vision, theory, and method of Digital’s approach. Information covers the walls, gleaned from the March MD-12 executive meeting, formal briefings, and from responses to recent information requests. The first draft of the MD-12 Work Process Framework occupies the “power spot” on the wall: It displays the phases of the plane along one axis and the functions along the other. The MD-12 Process Room opening is a success, the most important measure being Douglas’s instant willingness to cooperate with Digital to flesh out the Framework and to develop multiple process views. Within hours, Digital hosts the first of 10 meetings over the next two months with various cross-functional mixtures of Douglas staff. New information replaces obsolete information, blanks get filled in, concepts jell, and new graphics capture the shifts. All this information shows up on the walls of the Process Room. Within a week, the MD-12 Process Room moves to a Douglas building at Long Beach. We take over a conference room in the program's executive suite with a window overlooking the runway where MD-11s are running their test flights. In this magical setting, we bring the vision of the MD-12 alive and explode it onto the walls of the process room to keep the five-year 750,000-task program within the mental grasp of the teams of people that meet in the room. As the picture of the MD-12 process stabilizes, the Digital team tests its various solutions against the long-term view of the work required. In numerous technical meetings with Douglas organizations and experts, Digital’s view gradually shifts from gathering requirements to demonstrating increasingly better solutions. By the time Digital submits its proposal at the end of August, it ties all technology solutions to the required work according to the plane’s life cycle framework. This story less concludes than it does sputter out. Digital is the clear winner of the technical evaluation of the plan produced by the bid team, but the executives cannot put together a winning business deal. EDS takes the business, but the MD-12 is never built. EDS does, however, subsequently garner several billion dollars in long-term McDonnell-Douglas contracts in the few years before Boeing consumes the whole company. Digital too eventually sputters out. Ken Olsen, who founded the company 35 years earlier, is gone in a year, Compaq eventually buys Digital, and the diaspora of its remarkable assemblage of talent accelerates. You are going to Washington, D.C., next week. You make reservations, set up meetings, and otherwise prepare in the midst of other activities. A few hours before the flight, you begin a new phase of this journey. Between being home and being airborne lie a number of hurdles: packing, traffic to the airport; an unexpectedly full parking garage; the momentary panic when you think you’ve forgotten your tickets; lines at the reservations counter, lines at the security gate, lines at the boarding gate, where you discover the delay in your flight. An hour later than you expected, you strap yourself in and the plane heads out to the runway. In one breathtaking instant, the takeoff phase is over and you are in flight. The flight itself is most of the journey. It’s where you do the real work of getting from here to there. In flight information comes from the crew in the cockpit, where they monitor sensors and adjust controls. The crew adapts to such variables as weather, traffic, and malfunctions by making changes in flight, with the ultimate objective of a safe landing, ideally at the scheduled destination. “In preparation for landing, please make sure your seat belts are securely fastened and your seat backs and tray tables are in their full upright position.” The flight attendant signals the start of the next phase, landing. Landing and takeoff are the most stressful and dangerous events within the flight process. Hitting the ground almost always jars. The arrival at the airport presents another set of obstacles—getting to a clear gate, opening the doors, “de-planeing,” collecting your baggage if you checked it, and finding a car to take you to your end point. With the flight complete, you arrive at your destination, a new status quo established. Thinking ahead (and remembering the morning’s delay), you decide to confirm your flight home and inquire about times for that trip to the islands you have been thinking about. You are at the beginning of the next journey even as you arrive. The five phases of flight are metaphors for the five generic phases of any team’s development, including a virtual one. There are two periods of predictable turbulence: Takeoff, the launch moment for teams; and Landing, the test period for the team’s work. Virtual teams also experience these predictable periods of turbulence in their development. Knowing about them in advance allows time for preparation so that they can be used to your advantage. Launch follows a sometimes-lengthy start-up period. It also usually involves a relatively short but intense period of activities that produces a plan and defines leadership. Perform is when activity accelerates, where tasks are undertaken and results accumulate. But growth is always limited, and deadlines always loom. Work must be tested, brought in for a sometimes dangerous “landing,” delivered to customers, and rolled out to users. A new status quo comes with the achievement of a goal that the next cycle of change will challenge. Little journeys are contained within bigger journeys that are part of greater journeys, or “vision quests.” Start-up to delivery may happen over a matter of days, or the process may take years to unfold. 	Start-up: Long or short, in the initial period people assess and gather information. Exceptions accumulate as people speak out and ideas are tested. 	Launch: At some point, things jell—or they don’t. 	Perform: If only we could live here permanently. People engage their energy and take huge strides in accomplishing real work as the overall effort achieves its objectives. There are problems and challenges, to be sure, but problem solving is the modus operandi. 	Tests: Risks converge here. Success may blind us, and we may exceed the carrying capacity of our environment. The innovation undergoes strenuous testing before acceptance. Forces of resistance mount their final assault. 	Deliver: The process passes a final milestone. Here the process may end, stabilize at a new status quo, or go into another cycle. A team is first and foremost a process: It has a beginning, middle, and almost always an end. No team springs to life full-blown and none lives forever. Words such as conception, gestation, birth, childhood, adolescence, adulthood, mid-life crisis, and old age all apply to team life. Powerful results accrue when any team, virtual or not, consciously works its way through a life cycle process. Virtual teams are living systems not machines. Everything about them is organic: They are made up of people with interdependent roles and a web of relationships aligned through shared purpose. As living systems, they are not biological organisms but rather social organisms, which have both a pulse and a life cycle. A team’s life cycle has its own rhythm, oscillating between coming together and going apart. This tempo obtains through the long-term patterns and peak moments of key gatherings, the overall life cycle, and the hour-by-hour churns of a team’s daily life. The proper metaphor—living system or machine—is critical to the understanding of virtual teams. It is hard enough to get face-to-face teams to “happen,” to “jell” over time. It is doubly hard for virtual teams. Teams grow. They take time to develop—and virtual teams tend to take even longer. Ironically, they don’t really have the time. 	Adjourning (usually omitted from the list). This resilient model retains its freshness because it accords with experience. Countless teams use it as a guide. Consciously or unconsciously virtually all successful teams follow this universal cycle of life. When applied to a team, the S-curve gives rise to some interesting ripples. Tuckman’s model points to stress points, an important, overlooked feature of the life cycle, times of natural turbulence and potential conflict. By anticipating the likely stress points, a new, still-forming team gains a powerful advantage. Team members can use these natural points of commotion to give their process the energetic lift it needs—or they can be thrown off-balance by conflicts that seem to come out of nowhere. While not all conflict is predictable, some of it is. The “Stressed S” is a generic process model (Figure 6.2) that we label in the flight metaphor: Start-up, Launch, Perform, Test, and Deliver Phases.3 There are two major points in a team life cycle where stress is predictable—near the team’s beginning and not long before its end. In Chapter 10, “Launch,” we show how to use this model and provide support tools. Virtual teams must be especially conscious of their dynamics. Behavioral clues are spread out not only in space but also usually over longer time frames than they are with comparable co-located teams. It’s easy enough to see when someone checks out of a face-to-face meeting; how do you know if the person on your con call is checking e-mail having used her mute button on her headset so that the tapping of her keys is not audible? (This gets very personal for us). Virtual teams need to design for this supercharged eventuality. Things go wrong all the time; projects are usually more difficult than you anticipate. Completion is usually a beat-the-clock adventure. Smart virtual teams develop methods that anticipate the eccentricities of the life cycle and plan for stress. Slowing and growing mean going from one level of functioning to another. We must disrupt stability for change to occur. Then things can stabilize anew. 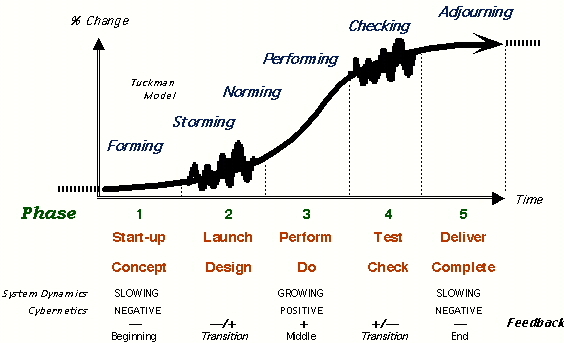 	Phase 1: Start-Up (Slowing). Feedback dampens and prevails. The idea for the team and its initial formation struggle against natural forces of resistance. The team’s initiators generate interest, gather information, and explore ideas. It may take an excruciatingly long time for the fuzzy beginning to take off. No one may even clearly recall when it happens—or the collective “aha” may be breathtakingly brief. Either way, change of any kind struggles against the status quo. Some teams never get out of this phase. There are no guarantees here. It always takes painfully longer than anyone thinks that it will, and for virtual teams it often takes even longer still. 	Phase 3: Perform (Growing). Most teams would much prefer to start right here. Growth is positive, accumulating, and exciting. Here the team does the bulk of its work. Results swiftly accrue and the team makes progress toward its goals, always satisfying. People meet and overcome obstacles. At its best, life is good and seemingly will go on forever. But growth cannot go on indefinitely without countervailing slowing actions checking and reshaping it. 	Phase 4: Test (Transition). Challenge time. Risks converge here. Success may blind us, and we may exceed the carrying capacity of our environment. The innovation undergoes strenuous testing before acceptance. Forces of resistance mount their final assault. The team must review results, finalize features, and limit resources. Meanwhile, time is running out and customers are waiting. All too often, this late-in-the-game second transition, from growing to slowing, is quite painful. Some teams end right here. Early participatory planning, i.e., customer involvement, regular reviews with stakeholders, and interim milestones can turn this chapter into a triumph. 	Phase 5: Deliver (Slowing). Delivery is the endgame, when the team adjourns. The process passes a final milestone. Here the process may end, stabilize at a new status quo, or go into another cycle. The team delivers results, provides support, wraps up details, and in the best practices, ceremonializes its endings. Slowing is dominant here, dampening feedback as the team seeks to stabilize at a new level. It may be the end of one lifetime and the beginning of another and its duration may be brief or long. We still can hear the echoes of the earliest groups in human history in organizations today. While archaeologists cannot excavate social organization in the same way that they can unearth shards of bone, they can infer a lot about it. By matching artifacts with direct observation of foraging societies that survive today such as the !Kung of the Kalahari Desert in Botswana, we have a reasonable facsimile of the organizing process of early teams. The same pulse that dominates team life today is there at the beginning. In the ancient life of nomads, groups of families come together and then go apart on an annual cycle. Foragers follow the rhythm of the seasons dictated by their sources of food. Even today, !Kung households move to the same beat that literally “goes with the flow.” Access to water moves the !Kung through seasonal cycles causing groups of families to diverge and converge. The !Kung beat holds for the way most people work—they come together and go apart. People work alone and then join up in a group. We do what we do best independently and then work with others to expand our capabilities. The basic social rhythm of human beings has not really changed in two million years. The !Kung’s major camp gatherings are like off-sites. These are special times and places for convening teams to literally “pull things together,” to resolve conflicts, and make decisions. They also are times of intense social interaction. Some managers regard the community-building aspects of such meetings as so important that they insist on them regardless of tight deadlines and budgets. As we inaugurate the age of virtual teams, such meetings become all the more important. Most people we talk to continue to stress the importance of face-to-face interaction to solidify virtual teams. Face-to-face time is increasingly precious, a scarce resource in limited costly supply. When the !Kung families come together, they suddenly find themselves living in a very different environment. Population greatly increases; numerous channels of interaction come into sight. Camps are alive with feasts and dancing, partying and ceremonies. Suddenly there are many hands to make light work. People hunt together and build common storage facilities, share resources and information, trade goods, and exchange tools. Perhaps most important, the camps are incubators for new families, where people make matches and find mates. The “together/apart” rhythm vibrates deep in all sorts of human groups. People congregate then separate not only over seasons but in the course of a day as well. Think about your day with some of your time spent alone and some time spent with others. Time-lapse videos in Steelcase sponsored research show a remarkable pulse to team life.7 Co-located teams of people come together for a time, then separate to do individual work—a together/apart fluctuation that replays many times over the course of the day. Virtual teams have a harder time getting started and holding together than co-located teams. Thus, they need to be much more intentional about creating face-to-face meetings that nourish the natural rhythms of team life. Activities that people undertake together and continue apart spark life. Establishing the life pulse is not hocus-pocus. It lives in how we choose to start things, whom we invite to participate, what agendas we create and plans we make, which tasks we implement, when we reach milestones, and how we bring closure. You will recoup time spent in the first two phases many times over in later phases. Mistakes, mistrust, unexpressed viewpoints, and unresolved conflicts all too easily introduce themselves and become part of operating norms. Lack of clarity around goals, tasks, and leadership hobbles the team in the performance phase. Failure to establish criteria and measures for results ensures a rocky ride during the inevitable testing phase regardless of whether the team is co-located or virtual. Anticipation is the recommended prescription. Coming together is a major challenge for virtual teams. For millions of years this has meant, of course, face-to-face. In the world of virtual work, togetherness means something broader—at the same time (synchronous) events. Most of the virtual teams that we’ve interviewed use telephone conference calls to provide some means of synchronous meeting and many rely on videoconferences as well. Usually such same-time events include pods of people in different locales. A regular weekly meeting of one Ernst & Young International CIO team is a videoconference, tying together four people in New York and another five in London. The people at Buckman Labs have found, as have many other companies, that a very active online conversation can be fast-paced enough to seem almost real-time. Buckman’s early chat facilities allow people who never meet (and might never meet) to have “screen” conversations where they talk about their families and hobbies. The major advantage of these sessions is that they quickly build a modicum of trust and usually cause affection to develop among the participants as they glimpse one another’s private lives. We recently “sat in” (virtually via conference call from Massachusetts) on a Pfizer team meeting with people on videoconference in Groton, Connecticut; Sandwich, England; and New York City, with everyone clicking along through their virtual team room on the web. Such meetings are taking place around the world, in different combinations, stretching everyone’s ability to comprehend the technology and the experience. While the range of synchronous options is growing rapidly, as is the bandwidth required to carry rich real-time interactions, a new channel has been added to the human repertoire–non-real-time or persisting asynchronous communications. Threaded discussions, online conversations that resemble verbal exchanges, are the most common example. Portals, intranets, and extranets localize all the communication media into continuous digital campgrounds. These “virtual water coolers”9—reminiscent of the !Kung gathering around Kalahari water holes—offer entirely new options for shaping meaningful aggregation in virtual teams while supporting their dispersion. Time is an essential dimension of human organizations, whether virtual teams, enterprises, or nations—and it poses a dilemma. With the blurring of the line between home and work, complaints prevail about lack of time. To see how immersed we are in time as groups, we need to expand beyond our limited view of time as a ticking clock. Clock time is, of course, important. This is the physical level of time, the precise slicing of which is emblematic of the Industrial Age with its foundations in Newtonian mechanics. “Calendar time,” the daily schedules of minutes and hours that repeat in patterns of weeks, months, and years, tends to dominate our lives. “There's never enough time” is directed at the limited hours in the day to do everything we need or want to do. For people working together, dates mark meetings, task deadlines, team milestones, holidays, personal commitments, and the needs of family life. Agendas and schedules are tools for creating and anticipating our futures. Learning how to create agendas for virtual team events is a vital skill for 21st century leaders. While the agenda maps the minutes and hours of time spent together, the overall schedule ties together days and weeks. Schedules may just include same-time events, or they may expand to all activities, including different-time ones. Which brings us to looking at time as process. The together-apart pulse reflects biological characteristics of time, organic rhythms of human processes that syncopate life. This is time in “chunks” of duration. In working life, these show up as events and tasks, process components. This is not time marching on. Rather it represents the results of human choice and design—why, when, and how we'll meet; why, when, and how we'll divide and do the work. In practical terms, this is “project time” and its signature display is the Gantt chart, typically a bar chart of tasks showing start and finish dates along an axis of calendar time. For all but the simplest teams, project management is a critical and often overlooked ingredient for successful distributed work. Co-located teams can quickly share ideas, correct misunderstandings, and work through problems. Virtual teams need to be more explicit in their planning and their plans. Clarifying goals, tracking tasks, and accounting for results all are part of elaborating process time in a manner visible to all members of the team. The team embeds this detail in a larger context. Processes have beginnings, middles, and ends, repeating cycles of change. For human groups, change and growth are stories in larger stories. All groups within groups within groups are on journeys within journeys within journeys. In the Big Picture, this is evolutionary time. Cycles are made up of phases and represent time on a larger scale, the really big chunks of lived time. We have phases of our lives, from childhood to wisdom. Our organizations go through phases of development and change as well, so team dramas are often within the context of larger organizational dramas. And we are all immersed in the really large-scale drama of change in our global civilization, each grand Age another phase of human existence at the leading tip of the planet's evolution. It is notoriously difficult to see the phases we’re living through in the moment, particularly since we are prone to see work move along faster than it actually does. Hindsight is the wonderful educator on the impact of phases. Recognizing phases and changes between them is often a key contribution of an outside observer (facilitator, consultant). The tool to use to manage cycles is high-level life cycle planning. Put your virtual team or network into a development context. Beginning with the end in mind, as Stephen Covey suggests, imagine the feeling of a successful process as it moves along through its early struggles, jelling turbulence, and daily progress to final test and delivery by a product development team. Design to the phases with as much anticipation as you can muster, then ride the inevitable waves of change as you live them. And what is it that pulls/pushes groups of people through time? It is shared purpose. 2 Ludwig von Bertalauffy, General Systems Theory: Foundations, Devel­opment, Applications (rev. ed.) (New York: George Braziller, 1968). 3 Lipnack and Stamps, The TeamNet Factor, pp. 221-223. 4 Senge, The Fifth Discipline. 5 Technically, “slowing” is negative feedback, “growing” is positive feedback. 9 Jessica Lipnack and Jeffrey Stamps, “The Virtual Water Cooler: Solving the Distance Problem in Networks,” Firm Connections 1, No. 2, May­-June 1993.